Sometimes you fall for people's work rather hard. 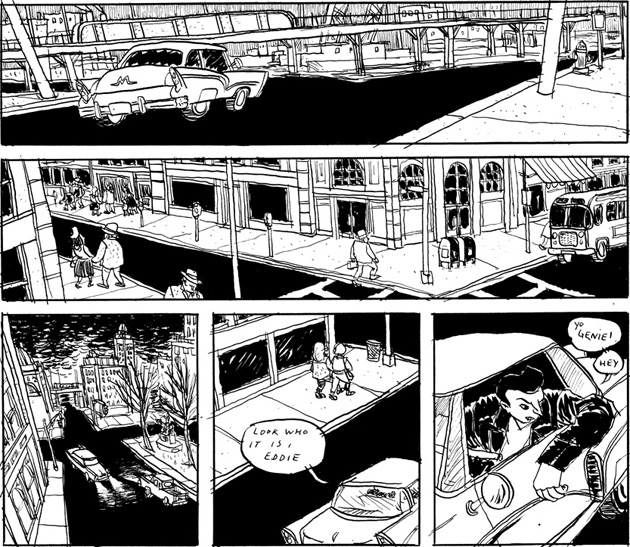 Which has been the way for me and Brendan Leach's comics ever since I read Pterodactyl Hunters in the Gilded City last year. Leach hasn't a vast body of comics work- afore-mentioned Pterodactyls aside, a mini called New Sludge City released with Retrofit last year, and ongoing series Iron Bound, but there's a quality to his art in particular that grabs me: it has a real personality that reminds me of Quentin Blake in its lines and expressiveness, but with a vulnerability that makes his work so open . His storytelling is good too; natural and organic without the feeling that you're deliberately being led towards certain places. It was with much excitement then, that I read the news of Ironbound being released as a graphic novel this year, complete with a record. You can read the story so far here, where Leach has uploaded the pages on a dedicated tumblr blog. He also currently has a special offer in his store where you can buy a signed artist's edition of New Sludge City, complete with an original drawing for only $20. I already have a copy of the comic, but I would very much like to upgrade to the addition of a lovely drawing of some pterodactyls. But: ghastly bills. I'd encourage everyone else to take advantage though.